Celtics need to regroup after loss. The Boston Celtics have played the championship Miami Heat and the Milwaukee Bucks. They have lost to both. On the first night of the 2012-2013 season, the Heat hammered them in Miami 120-107, and then last night during the Celtics’ home opener, the Bucks won easily 99-88. Is there cause for concern? How worried should fans be? It’s a little early for any of that. Here’s what I see. Right now the Celtics are a good “paper team.” What I mean by that is that the Celts certainly look good on paper. They appear to have premium players, a decent bench and the ability to score and defend. But what’s on paper is not showing up on the court. That’s always perplexing. Boston is dealing with the loss of one pivotal player—Ray Allen. That seems to involve more adjusting than was perhaps first thought. Thus far the Celtics seem to always be behind. They have not led at the end of any quarter. They are always trying to catch up. They can’t quite get connected on the court. They really aren’t playing like a team. A step behind, a pass missed and shot off target—that’s where they are. There’s a new mix on this team and that’s going to need to come together. How long will that take? It’s better if it happens sooner than later, but it could be later. Fans might take solace in the fact that the Los Angeles Lakers are 0-3. Look for Doc Rivers to play with the lineup. He’s got to find the right mix on the court. Also, I expect these guys to start communicating better as a team. I’m looking for better defense. This club doesn’t quite know how to stop opponents. On the other end of the court, they’re having a tough time putting together any type of cohesive attack. Up next, today, are the Washington Wizards (0-1). They will play the Wizards in Washington. I think the Celtics will be able to out score them and handle them on defense. Boston should come in focused, energized and ready to win. 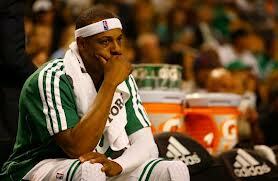 I think Paul Pierce, Kevin Garnett and the rest of the team will bring it home. The Celtics win today, taking a single but much needed positive step while on the road.